Well Hello True Believers! I hope all is well with you all! It has been a crazy time around here! I am Trainer/Coach/Motivator my beautiful wife as she is training for her first Half Marathon! I am so excited and proud of her, it isn't even funny. In the past almost 3 years that I have been a runner, she and our daughters have braved all sorts of weather to be there to cheer me on at every single Finish Line. I am honored that I can return the favor! We'll be doing the Louisville Triple Crown together (Anthem 5K, Rodes, 10K, and Papa John's 10 Miler) together, so I can pace her, and keep her focused on race mornings. I am so excited for this. Since then, we've both been losing weight. 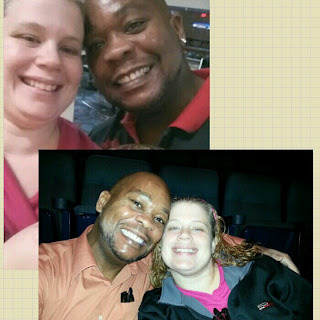 Below is a picture of us from Date Night in November (top), and Date Night from a few weeks ago (Bottom). Note the differences in our faces. The major reason for our continued weight loss is the use of My Fitness Pal! This app and website makes you accountable (as long as you are honest) in calories in and calories out. Pretty straightforward, but SO incredible when you have full knowledge of serving sizes and everything. I included the weight loss ticker at the top of the blog, because I am proud of what I have accomplished these past couple of months as well. Below is me in my Cross Country Coach's shirt (y'all know I coach Cross Country for our Daughters' school, right?). 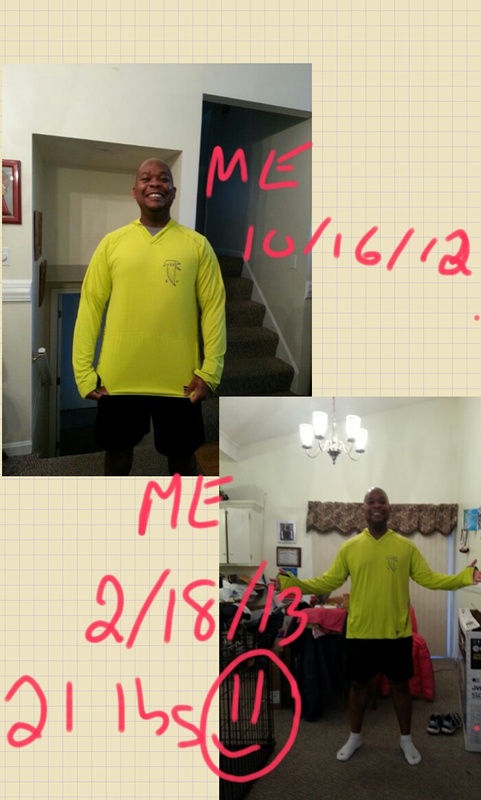 I started at 251, and am smaller than the pic below...I just broke through the 230's and am now in the 220's!!! My (1st) goal is 220, and am actually almost there. This is not a fad, or diet, the weight I lost will never be a part of my life again. A wonderful side effect from my weight loss is that I have shaved off a full minute per mile off of my pace!! Even as I am typing this, Damary is in the "Fam-Cave" on the treadmill doing her longest run EVER, 7 miles!! Next weekend is the Anthem 5K, and trust, I will have a report. She now joins me at 3:30 in the morning and the Fam-Cave becomes the Sweat-Cave and we get our workouts and runs in, while keeping the baby monitor on, in case any of the 3 girls get up. I love my wife unconditionally, and always will, with my soul. I told her no matter what weight she has been or is, that never changes. I am just happy because she is starting to see herself the same way that I have ALWAYS seen her: as a beautiful, unstoppable, force of nature! I ADORE how she is starting to believe in herself. I enjoy how so many people tell her how much of an inspiration she is to them. I have always been inspired by her, and consider my life better, and my heart whole, because of her. If you are in My Fitness Pal, and we aren't already, please send me a friend request. I love encouraging others, as well as learning from others! School is still going well, as I have about 2 years left until I have me B.S. in Nutrition Health. I also have plans on becoming certified as a Personal Trainer. 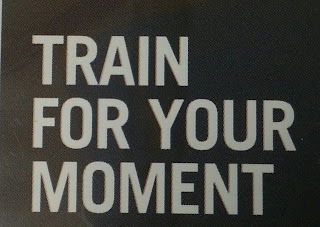 I want to help everyone Train for their Moment, as well as help them explore their relationship with food. It isn't enough to just tell someone to work out 6 days a week, or don't eat this, or don't eat that. I want to help others with understanding and conquering their relationship with food as a whole. This will pretty much mean no Marathon for me in 2013, most likely, but I will get a few Half Marathons in, as well as other races. Ok, off to go finish cheering on Damary, as well as put the youngest Super Princess down for her morning nap. I hope you all are doing well!! Much Love!! i was smiling the whole time i was reading!!! i cant wait for a recap of Damary's first race!!! oh and btw im doing the marine corps historic half on may 19th! I can't read to read more about ALL of your training! You amaze me with all that you juggle and handle and do it phenomenally! You have and always will be a huge inspiration to me. You're determination to always grow and get better is amazing. I love that you have inspired your wife, and I hope you know you inspire so many others. You're hard work is paying off, you and your wife look incredible and I love hearing about your weight loss journey, while you're losing weight you are gaining so much more wisdom and experience and that's the best part. You are great role models for your children and they are lucky to have parents who work hard, and put stock into a healthy lifestyle together. Thank you for sharing, and thank you for being an inspiration....You really are superman. Laura....ummm...Thank You doesn't begin to cover it! I showed this to my wife and I am choked up with humility at your comments. I truly am not sure how inspirational or a role model I am, I just get up everyday and try my hardest. Much love to you, my most amazing friend!